Write the words to a patriotic song on strips of paper. Let the boys put them in the right order. Examples of songs include: The Star-Spangled Banner and America. Pictures of the associated states (or name typed out) where the landmarks are found. ü As Scouts arrive, each is given either a landmark or a state. ü Scouts must find their partners. ü Cover tables with white butcher paper. ü Divide each table into four to six sections. ü At the center of each section, write a large alphabet letter. ü Challenge each table to come up with as many names of American towns, cities, states, counties, attractions, etc., as they can think of that begin with the letters on their table. ü They write their answers on the paper with crayons or markers. ü Prizes can be awarded for participation, longest list, most unique items, etc. Variation: Make placemats with large alphabet letters in the center. Each individual can play as above. ü Then cutting them into puzzle pieces with a razor knife. ü Give each family a puzzle to put together. 1. Place all of the names of capitols of the United States in a container and have a cub scout draw out names until a grid 4 X 4 is completely filled up with letters of capitols or states. 2. It would be best to do this game on a chalk or grease board so that it may be changed often and regularly. 3. The object of the game is to see how many words the Cub Scouts can make up in a time frame of one minute. 4. The cub that has the most valid words wins. 5. Any words that are duplicated by another cub scout do not count - they cancel out each other. 6. Keep this game going until all the 50 states and their capitols have been used. 7. As one or the other is drawn say it out loud and see if any of the cub scouts can name the state to which it belongs. 8. The letters have to be touching and no letter can be used more than once in one word. 9. You can go diagonally, backwards, make angles so long as the letters are touching. Here are some of the words that I found in the grid-salt, lake, den, vet, red, nerd, as, Ankle, alas, real, lad, leader, ten, etc. ü Make posters of well known buildings or symbols and put them up around the room. ü Give each person a numbered piece of paper. ü Ask them to identify the posters and write the proper name by its corresponding number on the sheet of paper. Suggestion are: American Flag, White House, Lincoln Memorial, Eagle, Presidential Seal, Uncle Sam, Statue of Liberty, Mount Rushmore, Stone Mountain, etc. ü Copy an outline map of the United States so that you have one for each Cub Scout or one for each person at the pack meeting. ü People should write the name of each state and it’s capital in the space for the state (or as close as possible to small states, with an arrow pointing to the appropriate state). ü After the meeting opens, reveal a large U.S. map for everyone to check answers. ü Give a prize to all who correctly identified the states and capitals. ü Suggest that they write in any additional information they know, such as the state bird, flower, tree, song, or nickname. ü People write their names on the papers and turn them in. ü A leader or other adult uses a list, an encyclopedia, or other reference book about the United States to check the papers. ü Give a prize to the one with most correct answers. Write the word AMERICA down the page and write one word beginning with each letter that describes America. American ABC’s -Can You Name Them? P Give everyone a sheet of paper with the letters A to Z going down the left side. P Tell them to write one American place or thing for each letter from A to Z. Using maps and atlases, have the Scouts and families find one geographical location for each letter of the alphabet. Examples: Arizona, Baltimore, Columbia River, Denver, etc. P Provide boys with crayons and paper so everyone can design a NEW American Flag. P Have them explain the symbolism behind their new flag. ü Cut out large versions of the letters in America. ü Place the pieces in a bag. ü Give each boy or group a letter and have them put their letters together. Display scenes from around the United States, pictures of famous Americans, or historical objects from American History – each one should be numbered, but not identified. As families arrive, they are given a sheet of paper with the numbers along the left side. They must work together to identify each item by name or location. Can you match up these mottos with correct states? www.infoplease.com/ipa/A0801718.html has a list of all state mottos – be sure to include your own state in your game! 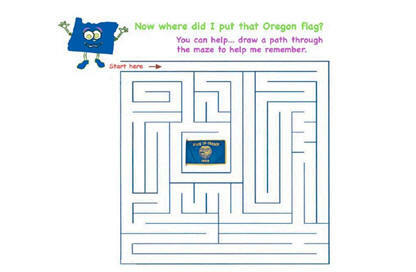 Give each participant or pair a paper listing the first letter of the name of each state in the US. Have them write each state on the blanks. Provide a blank map if this helps. 1. Give the Cubs a phrase made up of two or three words. 2. From that phrase, the Cubs must come up with as many words as possible. Challenge them by making them think of words only with “B”, or “S”, or “D,” or limit them to just three letter words or four letter words.